Enter Zenity. 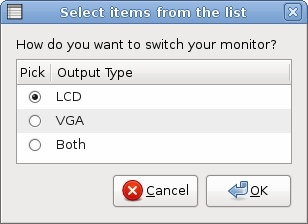 Initially I created a PyGTK monitor switcher, yet wanted something even simpler. If you aren't in the know, Zenity allows you to create super fast, super simple dialogs to regular commands. After you click "ok", the command is executed, and the dialog disappears. Perfect for switching displays. I send a big cheers and thanks to the Zenity guys, I'll surely use this quick language more frequently.